As a law-review editor and member of the Order of Barristers, Christian’s success in law school led to a federal judicial clerkship, after which he joined FSC. The first of FSC’s non-founding lawyers to be made partner, Christian focuses his practice in both state and federal courts on a broad range of complex oil and gas, commercial, and business disputes, as well as estate and trust litigation. One of Christian’s many successful representations was a recent seven-figure FINRA arbitration award obtained with Walker Friedman for an investor in a securities-fraud matter. 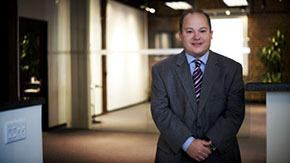 His track record led to his selection by Thomson Reuters as a Texas Super Lawyer Rising Star for eight straight years, from 2004 through 2011, reflecting his peers’ judgment of Christian’s abilities as a trial lawyer. Over the years, Christian has also been active in the local legal community, including serving as president of the Fort Worth/Tarrant County Young Lawyers Association. Christian has been accorded the highest Peer Review Rating™ by Martindale-Hubbell®: AV Preeminent®.